This plastic sheet allow.. sun's radiant energy to be trapped in the SOH hence it is done during Me hot period of year when the soil will receive rnost direct sunlight. When properly done, the top 6 inches of Ihe soil will neat up Co as high. 61clegree centigrade. Depending on the location it coMrols a wide range of soil borne pests, such as, pathogens, nematodes, and insects. Control of soil pests is usually bert for organisms f ound in the upper 6 inches of earth. 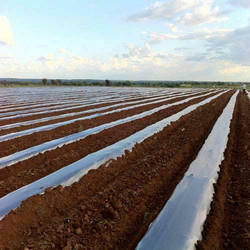 Solarization leaves no chemical residues and It can improve soil structure by increasing the availability of nitrogen and other essential nutrients for growing healthy plants, as well as controlling a range of pests. Soil solarization also speeds up Me breakdown of organic material in Me soil, often Ng in the added benefit or' elease of soluble nutrients such as nitrogen (N01.-, fille), calcium Cal, magnesium (MO, potassium (,), and fulvic acid, making them more available to plants. Plants oftengrow faster and produce boM higher and better quality yields when grown in solarized soil. This can be attributed to improved disease and control, the increase in soluble nutrients, and relatively greater proportions of helpful soil microorganisms. Effectiveness on Various Pests:The degree various pest can be controlled is related to the intensity, depth, and duration of the elevated soil temperatures. Although some pests may be killed within a few days, 4 to 6 weeks of exposure to full sun during the summer is required to ensure control of many others. Fungi and Bacteria: Solarization coMrols many important soilborne fungal and bacterial plant pathogens, including those that cause Verticillium Fusarium Phytophthora Root rot, Southern blight, damping off, crown gall disease tomato canker, Potato scab, and many others. A few heat-tolerant fungi and bacteria are more difficult to Controlwith solarization. Nematodes: Soil solarization can be used to control many species of Nematodes. Solarization for nematode control is particularly useful for organic and home gardeners. However, soil solarization is not always as effective against nematodes as it is against fungal disease and, because nematodes are relatively mobile and can recolonize soil and plaM roots rapidly. Control of nematodes by solarization is greatest in Me upper. inches of Me soil. Nematodes living deeper in the soil may survive solarization and damage plants with deep root systems. Soil solarization controls many of the annual and perennial While some species seeds or plant parts are very sensitive to soil solarization, others are moderately resistant and require optimum conditions for control (good soil moisture, tight-fitting plastic, and high solar radiation),Solarization generally does not control perennial as well as annual because perennials often have deeply buried underground vegetative structures such as roots and rhizomes that may resprout, Rhizomes of Bermudagrass and Johnsongrass may be controlled by solarization if they are not deeply buried. Beneficial Soil Organisms: Although many soil pests are killed by soil solarization, many beneficial soil organisms are able to either survive solarization or recolonize the soil very quickly afterwards. Important among these beneficials are the mycorrhizal fungi and fungi and bacteria that parasitize plant pathogens and aid plant growth. The increased populations of these beneficials can make solarized soils more resista. to pathogens than nonsolarized or fumigated soil. Earthworms are generally thought to burrow deeper in soil to escape the heat. Looking for Soil Solarisation Film ?